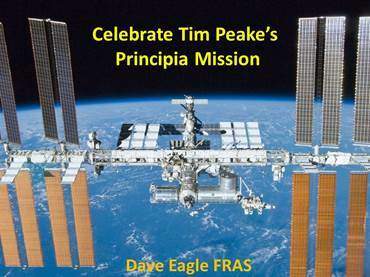 Celebrate Tim Peake’s Principia Mission with Dave Eagle. Between December 2015 and June 2016, Tim Peake and his two crew-mates flew to the International Space Station for their Principia Mission. This informative and fun presentation, incorporating multi-media as well as audience participation elements, overviews what Tim achieved during his 6-month stay. This presentation is suitable for all ages 10 – 110! You can find out more about Dave and what he does at his website.